The M&G EW Series Diaphragm Seals are miniature seal elements designed for operations in new construction and MRS applications. These all welded, 316 stainless steel seals are an excellent alternative to high-cost custom or specialty seals. They feature a diaphragm that is welded directly to the housing, and are ideal for any application where process media and pressure pulsation may adversely affect the life of the gauge component. Typical applications include spray paint equipment, agricultural equipment, water and waste equipment, and chlorine treatment equipment. 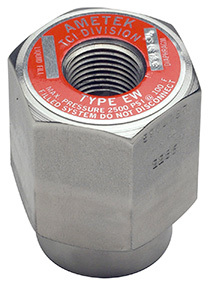 An EW Series diaphragm seal features a unique construction that is free of bolts and gaskets. These seals protect against leakage and fugitive emissions as defined by the EPA Clean Air Act of 1990.